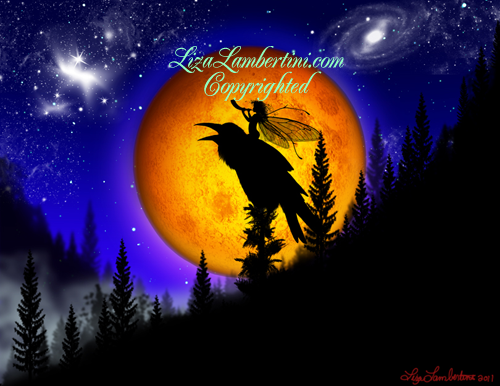 The raven and faery call by the hunters moon. This be a blessed time. Created in the spirit of joy, strength, love, justice and courage. I love ravens because of their intelligence, their beauty, close family ties and affection. I think the way the blue,green,purple and magenta rainbow shines on their glossy feathers is truly beautiful. 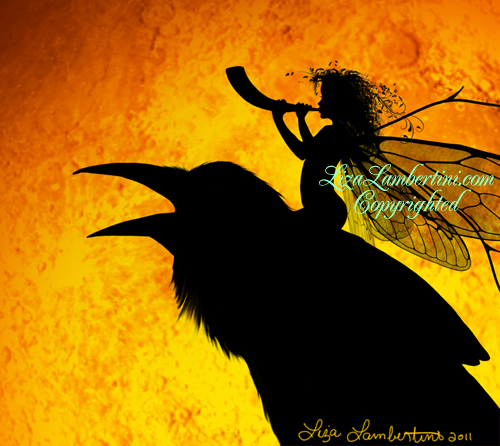 The little faery is also named Raven after her "kismet" the raven. They are close and her positive magic adds to his own light. When I first began this drawing I struggled with it. One part of me wanted to do one thing, then another part of me wanted to do another thing. While I wont give up on the other spark that came to me I had to allow for the flow of it to be true to myself. I just surrendered to what brought joy to my heart and this is what came out. :) Inspired by the Morrigan whom I have a great love for and as she presents herself to me within my work. To thine own self be true! Calling the magical ones home! I love this song by Laura powers "Morriguns Quest"